FanMailAddresses.com lists over 15,000 addresses for celebrities and entertainment related companies. Whether you are an autograph collector, charity fundraiser or a fan wanting to send fan mail to your favourite stars, FanMailAddresses.com is for you! Up-to-date addresses for celebrities from all fields including actors, actresses, pop stars, models, authors and sports stars. 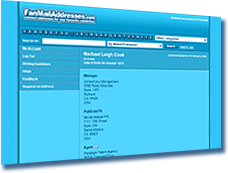 Up to four contacts for each celebrity covering managers, agents, publicists, lawyers, direct contact addresses and email addresses where available. Search by name, address, profession and more. Symbols to show which addresses members have reported as successful for autograph requests. Addresses for films that are in production - a great way to get responses from some of the bigger stars. Entertainment industry addresses including film companies, television companies, film studios, record labels, concert venues and theatres. Address request service. If a celebrity you would like to contact isn't listed, simply drop us an email and we will do our best to find a contact address for you. Only £14.99 for 6 months membership or £24.99 for 12 months membership.